There's always one - the pop group member who breaks from the band to explore new musical opportunities. From Siobhan Fahey to Geri Halliwell to Camila Cabello; Robbie Williams to Brian McFadden to Zayn Malik, music history is littered with early departures. 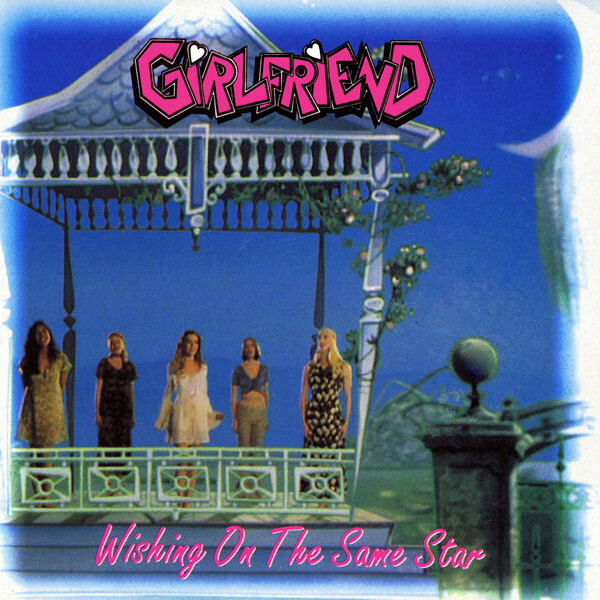 This week in 1994, Australia's biggest girl group of the decade charted with their final single as a five-piece. Perhaps it was a good time to jump ship - its performance was a far cry for their chart-topping debut two years earlier. At the top of the ARIA singles chart this week in 1994, DJ Jazzy Jeff & The Fresh Prince provided some respite from Bryan Adams with "Boom! Shake The Room" climbing to number 1 for a solitary week. Second single "Sweat" had just sneaked into the top 50 and this third slice of Italo dance did the same with the top 100. Surprisingly given my taste at the time, I don't think I've ever actually heard this song before. Back with their first new music in six years, the Australian band recruited a host of newsreaders and reporters (including Anne Fulwood, George Negus, Mary Kostakidis, Jeff McMullen and Richard Morecroft) to lip sync the song's lyrics in the music video. A second top 100 entry for the Icelandic singer, "Venus As A Boy" came with a video directed by Sophie Muller, who'd worked on clips for Eurythmics (and Annie Lennox solo) and Shakespears Sister, among others. I wonder how many people bought this mistakenly thinking they were purchasing Cut 'n' Move's much more successful single of the same name. Originally released in 1992, "Give It Up" reached the UK top once reissued in late 1993. The sample-ridden track was in turn sampled by Simply Red for "Fairground", while Dutch duo The Goodmen have also released music as Chocolate Puma and Riva. How quickly The Lemonheads' chart fortunes faded. The first single from Come On Feel The Lemonheads, the follow-up to breakthrough album It's A Shame About Ray, "Into Your Arms" was a surprisingly small hit. I remember it quite distinctly from the time, and if you'd asked me before I sat down to write this post, I would've guessed it had been much more successful. The song was written by former The Hummingbirds member Robyn St Clare, who'd recorded it five years earlier with The Lemonheads' bassist Nic Dalton in their guise as duo Love Positions. This would be the last time the band would see the inside of the ARIA top 50. 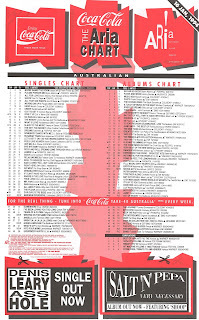 Another act making their final top 50 appearance are Australia's The Badloves with what would be their most successful single, although I'd argue "Lost" is much better known. No doubt benefitting from their recent guest spot on Jimmy Barnes' cover of "The Weight", the band ventured into the top 40 for the only time with this track, which pokes fun at celebrities that champion on-trend causes. Robyn Loau must have known which way the wind was blowing as far as Girlfriend was concerned. How could she not? "Heartbeat", the lead single from the girl group's second album, It's Up To You, had just scraped into the top 40, while the album itself barely made a dent on the top 30 - a major comedown from their first album. Then came this second single, written by big ballad legend Diane Warren and previously recorded by American pop singer Keedy (whose "Save Some Love" was criminally overlooked in Australia). Apart from being fairly insipid, it's a good pop song and its underperformance pretty much established Girlfriend's time was over. At least, in this form. As it would turn out, Robyn's decision to depart later in 1994 was the best thing she could have done - for both her and her former bandmates. Next week: a long-forgotten boy band arrives, as does a teen act of a different kind. Plus, the song that would go on to take out the first ever year-based Triple J Hottest 100. I actually prefer "Faces" to "Maximum Overdrive", as far as under-performing 2 Unlimited singles go. Although I didn't think much of it when I first heard it. They will, however, have a fight on their hands trying to convince me that "boomstikkadaboomstikkadaboomstikkadaboom" is a real word. I don't think I'd seen the 'Hundreds of Languages' video before. It's interesting that a bigger fuss wasn't made about it, given that it features several prominent TV newsreaders and current affairs program hosts lip syncing the song. Though I vaguely remember hearing a segment on GANGgajang (who I'd never heard of at hte time) in the background on one of the evening current affairs programs in my household around this time, so perhaps it did get some exposure. Surprisingly, given that they're an Australian band, and rage have aired several of their videos over the years, they don't seem to have aired this one in the digital era. Frying an egg was an interesting concept for a Björk video. 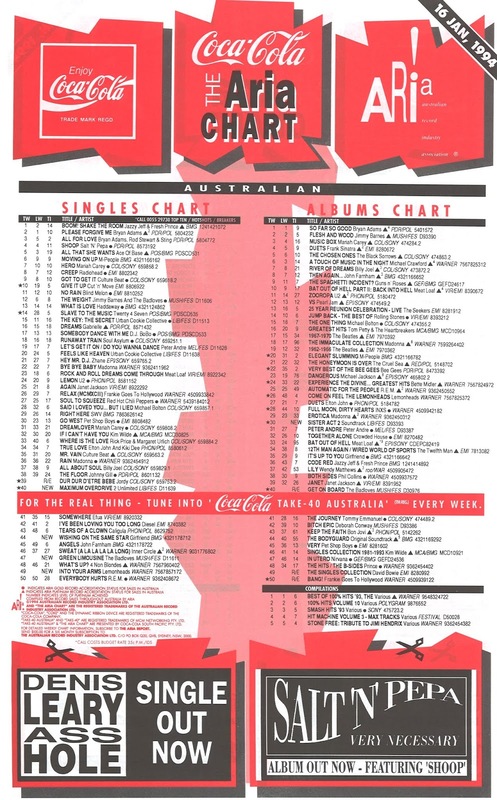 'Into Your Arms' appeared on 100% Hits Volume 10, released in early December '93, so its top 50 debut 6+ weeks later is interesting. As I always like to point out, 'Green Limousine' got a fair bit of mileage on the Summer Bay Diner jukebox. It's a bit twee, but I like 'Wishing On the Same Star'. I agree with you that this lot of 2 Unlimited singles deserved better chart placings locally. I wonder why the singles-buying public largely turned their backs on them after 'Tribal Dance'?